You may remember Akoha, a startup which launched at the 2008 TechCrunch50 conference which uses “mission cards” that friends pass to each other along with a mission ( i.e. give someone a book or buy someone a meal.) The idea is that users will socialize their missions, using your social graph to compete against friends and determine how your missions performed. Akoha has been played in more than 65 countries since the company’s launch. Today, Akoha is launching an free iPhone app and a redesign of its site. Akoha’s iPhone app. With the new app, Akoha has increased the number of missions that can be played. 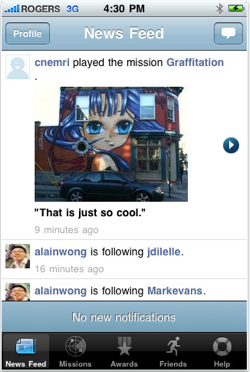 A now Akoha is rewarding players for completed missions with badges, similar to Foursquare’s badge model. Akoha is also allowing users to socialize missions by integrating with Twitter to allow users to broadcast completed tasks. Akoha was founded by Austin Hill and Alex Eberts, who together co-founded Zero-Knowledge Systems (now Rdadialpoint) in 1997. In 2008, the startup received $1.9 million in funding from David Chamandy (co-founder, Lavalife), Ron Dembo (founder, Zerofootprint.net), film producer Jake Eberts (Chariots of Fire, Ghandi), and seed fund Montreal Start Up.